From Irwin's own childhood comes his love for sailing. There are literally hundreds of interesting sea stories that can go in here, but they are for others to relate. Instead, you'll find two interesting articles. One relates the second leg of the voyage from City Island, New York to Sarasota, Florida. The first leg of the trip also ended in a rescue in Atlantic City, as I recall being towed in by two Coast Guard Cutters with three-quarters of an inch of ice on the decks and in my beard, and damaged sails from high winds and rough seas. 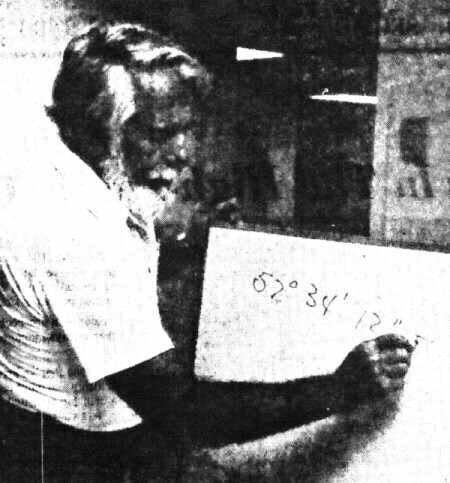 The second article describes a revolutionary Navigation Course that Irwin developed and taught while in Sarasota. A note about the pictures. There were actually three other large sailboats in Irwin's life, although pictures were not available. 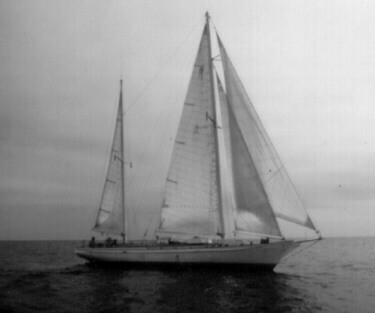 Between the "Gim Lung" and the "Serena" was a Cheoy Lee Bermuda 30 ketch named "Syzygy." Following the "Serena" were two Westerlys. A 30 foot Pentland ketch named "Elena" and a 22 foot Nomad named "Bunny." The Westerlys, I think, were especially significant to Irwin because it was on these boats that he and Bernita enjoyed many hours of romantic sails on the Gulf. An early childhood memory: Going into New York City to see the ship that brought the "Gim Lung" (Golden Dragon) from China. Many eyes turned as we sailed the Long Island Sound on our first large sailboat. Although the older kids will remember differently, I used to enjoy dangling my legs in the waves off the bow. The "Serena" was Irwin's pride and joy, and the most historic of his yachts. The 53 foot Herreshoff ketch was also the topic of many an adventure including the article below. Last week a New Jersey family came perilously close to capsizing or sinking in a storm at sea 30 miles Off-shore Ocean City in their 52-foot ketch. But their sailing adventure, which began In heavy seas and high winds, was to end in the resort on Thanksgiving Day with acts of friendship and generosity they would later describe as "a, new kind of experience for all of us." The events, which ultimately resulted in a rescue at sea by the U.S. Coast Guard, began the Sunday before Thanksgiving. Irwin Franzel, a physicist, his wife Barbara, daughter Susan, 12, and a friend, Alan Mudd, all of Westwood, N.J., were sailing along the East Coast to Sarasota, Fla.
By Sunday evening, their craft, the "Serena," was traveling several miles offshore the Delmarva Peninsula when they encountered three to four foot seas and winds between 10 to 15 knots. Although the stormy weather made for very rough sailing, Franzel, a sailor since childhood, had encountered similar conditions before, and decided to ride out the storm. However, as the storm continued throughout Sunday evening and into the early morning hours the next day, the wind steadily became more severe with waves reaching 12 to 14 feet in height. After spending a cold, rough and sleepless night, the crew of the Serena began to encounter more problems. As dawn broke, the ketch started to take on water as the waves became larger and more frequent. The wind was now blowing steadily at about 25 knots with gusts of over 30 knots. As water spilled into the cabin, Franzel found that the craft's bilge pumps were clogged and could not reduce the water level below deck. The sailboat captain immediately called the Coast Guard to report that his vessel was taking on water and had reached a level in the cabin between six to 10 inches above the floorboards. The call by marine radio was made at 6:50 a.m. Monday with the Serena about 30 miles SE of Ocean City. The Coast Guard immediately dispatched two 44-foot patrol boats, one each from Indian River and Ocean City. The Coast Guard also sent a helicopter from Cape May, N.J., loaded with drop pumps to aid the Franzel boat. The helicopter arrived at the scene of the craft shortly after the call, but had some difficulty in lowering the pump to the boat as the waves relentlessly tossed about the 52-foot craft. The first drop pump was lost overboard as the chopper crew attempted to lower it to the floundering sailboat. A second try with another pump was successful. By the time the Coast Guard's patrol boats reached the Serena at about 10 am., the 44-footers had been underway for three hours racing against the stormy seas. Franzel noted that the storm was at its worst during the mid-morning hours. The crests of several waves were breaking across the sailboat at a point even with the spreader on the mizzen mast, which meant the waves had reached a height of about 45 feet as they crashed across the craft. When the first Coast Guard patrol boat arrived, the Serena was put in tow for the long trip back ashore by the Guardsmen from Indian River. Before getting underway for the return trip, Boatswain's Mate Mike Todd jumped from the bow of the 44-footer onto the sailboat, grabbing the beam, to keep from being thrown overboard as the boats rolled back and forth in the heavy seas. Franzel said Todd looked after the sailboat as it was under tow and rendered whatever assistance the crew of the Serena needed as they began the seemingly endless 12-hour trip back to shore. "I had been without sleep for 36 hours. Susan and Alan had been seasick all night, and all of us were deathly cold and wet," Franzel explained. "Coast guardsman Todd stayed with us all the way in, and he was very kind, sensitive and competent. The Coast Guard's efforts to help us were outstanding. They were very professional - they all did more than their job." After enduring the tortuous seas for the 12 hours they were under tow, the Serena, escorted by both Coast Guard patrol boats, was safely moored in Ocean City about 10:30 Monday evening. On their arrival in the resort, Mrs. Franzel, a registered nurse, notified officials that no medical assistance was needed. The sailboat's crew was wrapped in blankets and taken to the Quality Inn at 15th Street where they were housed during their short layover in Ocean City while they fixed the boat's bilge pumps and made other minor repairs to the craft. Once the Serena crew was settled in Ocean City they began gathering supplies they needed to continue their journey. Mrs. Franzel went to Welsh Drugs to get some of the items they needed, and got into a conversation with Robert "Doc" Welsh, the owner, about their mishap. During the storm the crew members said they all had been too busy trying to control the flooding to be frightened. It was only after they were safely back on land that they had to reflect on the peril they had faced in the Atlantic storm. Despite the heavy seas and inoperable pumps, they had stayed afloat. The boat, Franzel noted, is 41 years old and has the distinct honor of being included in the Mariner's Museum in Norfolk, Va.
Franzel explained that the boat's original name was the "Mobjack" and was built by famous sailboat designer and author L. Francis Herreschoff. 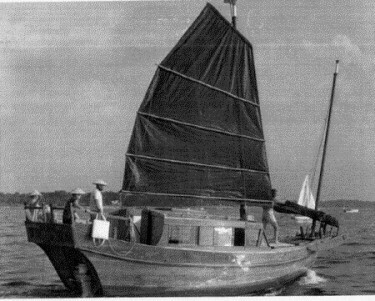 It was a prototype for the 72 foot "Ticonderoga," a craft which won the Transpacific and several other international sailboat races in the late 30's and early 40's. Welsh immediately invited the Franzels and Alan Mudd to his home to join the Welsh family for a traditional Thanksgiving dinner. "I was absolutely astonished," said Mrs. Franzel. "I mean if my husband had ever come home and told me that he had just invited a whole group of strangers to our house for Thanksgiving dinner, I think I would have killed him!" Despite the surprise the Franzels happily accepted the invitation and were the recipients of many acts of kindness from individuals during their brief stay here. "We have all been tremendously impressed with the hospitality of Ocean City," said Irwin Franzel. "The reception by everyone has been just marvelous. It's really a new kind of experience for all of us. We'll never forget the kindness we received here." A Sarasota mariner has devised a computer-assisted navigation system which puts the weekend sailor on an equal basis with the seasoned salt. Thanks to the marvel of the electronic silicon microchip and the ingenuity of Irwin Franzel the skipper who sails too infrequently to keep honed the considerable skills of celestial navigation can set sail to distant ports with reasonable assurance of raising them. And when he's not sailing, his navigation computer can keep a running tally of his checkbook balance, budget his grocery shopping and calculate his stock market dividends. Franzel, 56, teaches his copyrighted navigation system to students attracted by its word-of-mouth reputation for simplicity and dependability through the auspices of his own company, the Third Planet Inc., 2 Marina Plaza, Sarasota. FRANZEL IS SO confident of the efficacy and appeal of his course that he offers a money-back guarantee of the $200 enrollment fee if, after the first session, the student is dissatisfied. So far, he said, he's had no takers. What he has had is a steady stream of students - some seasoned sailors like himself, some neophytes with armchair ambitions to sail beyond known horizons to distant destinations. Franzel promises all who finish his course they will be able to fix their position within four miles anywhere at sea by the use of a sextant, the computer and a low-cost. digital watch with accuracy equivalent to ship's chronometers of 20 years past. While not precise, four miles puts the mariner within sight of any landfall and is, therefore, adequate for most navigation, he said. The students furthermore learn to determine their position in a matter of minutes through a simple set of procedures rather than relying upon the laborious manipulation of sight reduction tables and the complicated formulas required by traditional celestial navigation. IF UNSURE OF their competence, a few minutes spent reviewing Franzel's brief text can suffice to adequately retrain them. The course involves four sessions of three hours apiece and terminates with a final exam which requires the student to plot a course from Miami to Plymouth England. To achieve such a destination by traditional means, the navigator must manipulate six-figure bearings through a complex series of formulas, a process which introduces multiple opportunities for error and which requires steadfast concentration and precision, habits difficult to practice in a small boat at sea. While the traditional system may provide pin-point accuracy in the hands of a seasoned professional, Franzel said it may as easily yield a gross undetected error, particularly when performed by an unpracticed navigator. Franzel, whose list of professional credits include engineering and scientific design duties for the Federal Telecommunications Laboratories, Curtiss-Wright, and the Raytheon Co. among others, has programmed a portable computer to reduce the six-figure components of navigational formulas to almost instant results. A SEASONED SAILOR who has delivered yachts and sailed his own Herreschoff Mobjack schooner "outside" from New England to Florida, Franzel has practical knowledge of the mariner's navigational needs. The computer he selected for his program may be operated while sealed in plastic and has a battery with an operating life of 1,000 hours. Since most celestial navigation is performed during the day (star sights being exceedingly difficult to fix from the swaying deck of a small boat), Franzel has based his system on noon sun sights. The key to the system is a solar ephemeris, a timetable of the sun's position at any hour of the year. Standard navigation texts provide the latitude and longitude of the sun's position at any time by date and hour, or by date alone in the ephemeris Franzel provides his students. EXTENSIVE CALCULATIONS necessary to reduce the sun's coordinates to the second as required are programmed into the computer so that finding the necessary coordinates takes only moments. To avoid accidental obliteration of the programmed functions Franzel has fixed the programming key with epoxy cement. Although the system is designed for simplicity, it has proven satisfactory in use for a number of professional mariners, said Franzel. Warren May, formerly licensed captain of the Marina Jack II and now skipper of the charter sport fisherman "Gemini," said the system not only is simple, it provides acceptable results with reduced chance of error. Accomplished in the traditional celestial navigation method, May said many times on long-distance yacht deliveries he would establish a position "fix" that "I just knew was wrong." TO FIND THE ERROR and correct the position meant retracing "10 to 12 steps," a laborious process when accomplished at the chart table of a small boat. May said he has used the traditional, Loran and computer-assisted navigation methods and of the three, prefers the system he learned from Franzel for practical navigation. Meanwhile, Franzel said he is planning further modification to his system, which he believes will further simplify it and make offshore navigation even less austere a task for the part-time mariner.